What do you gain by becoming an ICAA Corporate Partner Member? You’ll leverage the credibility of ICAA and your status to build strong relationships with association members. ICAA’s expert counsel will also help you customize your offerings and match your goals to the needs of members. Through an ICAA Corporate Partner Membership, you’ll grow your knowledge and understanding of the market. Access information, industry research, publications, articles, webinars, virtual summits and toolkits, all designed to ensure your organization stays on top of the latest news and trends in active aging. You’ll make better decisions with a more informed view of the industry. In addition, tell ICAA members about your products and services year-round through the Journal on Active Aging’s “News from ICAA Corporate Partners” department (submissions must meet criteria for publication). Added exposure includes a corporate listing and logo in the “ICAA Corporate Partners” section in seven Journal issues. It’s a perfect way to connect regularly with ICAA members. You’ll also communicate your support for ICAA’s mission and highlight your organization with a corporate profile in the annual print ICAA Products and Services Guide and the multimedia ICAA Products and Services section of the ICAA website. (An online profile features video footage and 5 images.) 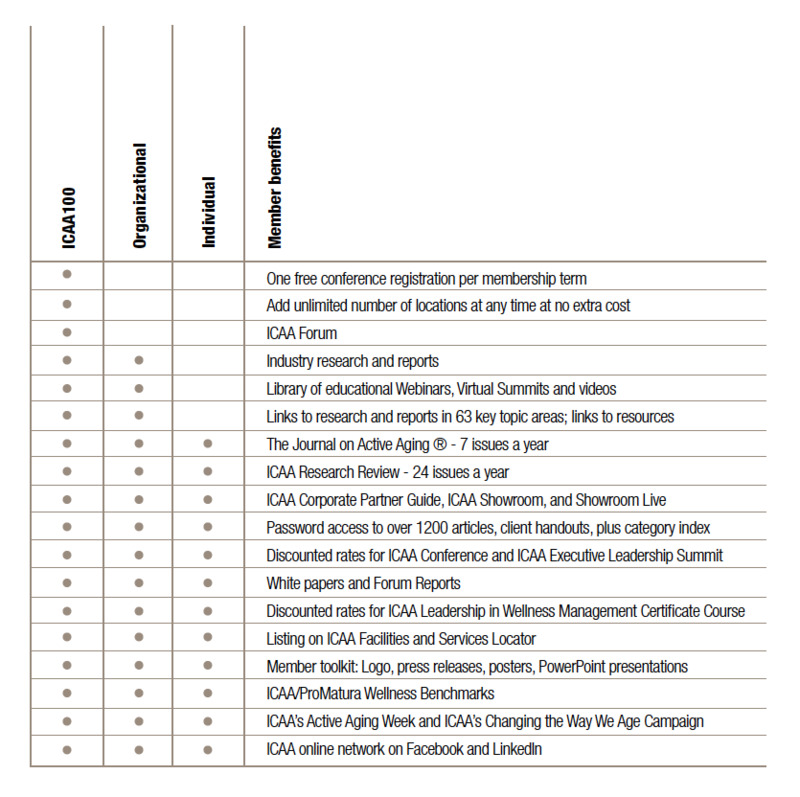 Only ICAA Corporate Partner Member organizations are profiled. If you’re looking to get involved with the active-aging industry, ICAA’s Corporate Partner Membership is the ideal plan for you. Who will benefit in your organization? The ICAA Corporate Partner Membership will benefit senior product managers, sales and marketing managers, and other personnel of industry suppliers. The cost: $2,550 per year.